Stuart Macdonald - Director of Avalanche Academy Ltd. Stuart first climbed Mont Blanc at the age of 17, and immediately fell in love with the Alps. He began instructing in the mountains while serving in the British Army, and lead numerous overseas expeditions to Alaska, Canada, Greenland and the Himalayas. He subsequently spent two years instructing at the Joint Services Mountain Training Centre in North Wales, Scotland, and Norway before leaving the Forces to train as an International Mountain Guide. His personal interest in avalanches began when he found himself in one on the slopes of Ben Nevis in Scotland. He has climbed around the world including ascents of Mt Everest and the Eiger North Face to name just a couple of routes. His personal philosophy on Avalanche Training is to "Keep it Simple" and he is a member of ANENA (French Association for the Study of Snow and Avalanches). He has lived in Chamonix since 2007, and is never happier than when in the mountains.Stuart is regularly asked for comment on avalanche accidents, and has appeared on numerous TV/radio interviews for BBC, Sky News, NBC and AP (Associated Press). Tim Blakemore - Tim has a varied background which has taken him to most continents on earth and he continues to travel widely. He has worked for the British Antarctic Survey, The National Outdoor Centre (Plas y Brenin), Outward Bound and was a former Deputy Head of Dukeshouse Wood Centre. In the UK Tim acts as a Technical Advisor to many organisations and continues to train and assess candidates for all the Mountain Leader Training awards. He has been published in various magazines and journals including articles on "Decision Making in Avalanche Terrain" in 'Summit' and 'Scottish Mountaineer'. 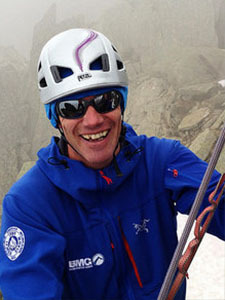 He currently delivers the British Mountaineering Council's Winter Safety Lectures in England and Wales. Tim is an IFMGA Mountain Guide and holds the Mountain Instructor Certificate (MIC). He's climbed many of the Alpine North Faces, too many Scottish winter routes to remember (up to grade VIII), and is a keen rock climber. When skiing Tim has a passion for the wilder, quieter areas. 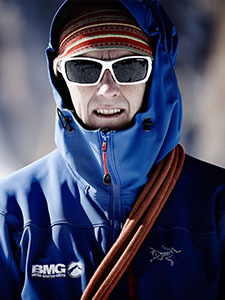 He is a member of ANENA (French Association for the Study of Snow and Avalanches), and is currently the Treasurer for the British Mountain Guides Association. Jonny Baird - Jonny's passion for the mountains started where he grew up - the West Coast of Scotland - and probably about the same time too! His youth was spent rock climbing in Glen Coe and Glen Nevis and also on the great ice climbs of Ben Nevis. His love for alpinism and skiing has taken him to the European Alps and onwards and upwards to adventures in the Tien Shan, Peruvian Andes, Greenland, Canadian Rockies, New Zealand and Australia. Jonny is keen to share his passion for snow with you, and to make it fun. He's a firm believer that a day of Avalanche Training should include studying some powder - at speed ! When he's not working he will be skiing, away climbing one of the icy north faces of the alps or most likely enjoying sport climbing in a sunny spot with friends in one of the many superb venues in the area. Jonny is also a member of ANENA (French Association for the Study of Snow and Avalanches). Robbie hails from Ireland and definitely has the relaxed Irish manner you would expect. 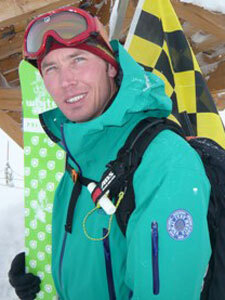 Robbie has been an IFMGA Guide since 2001, and has climbed and guided extensively around the globe. He is a strong believer in making simple decisions in avalanche terrain, and enjoying the mountains as safely as possible. He is a full-time resident in Chamonix, but heads back to Ireland every year to relax. Robbie is a Level 1 Instructor in the American Institute for Avalanche Research and Education (AIARE). Adam is an IFMGA Mountain Guide, and full member of the American Mountain Guides Association (AMGA). Adam grew up in New Hampshire and discovered his love for the outdoors in the White Mountains. He began climbing at the age of 15 and has devoted his life to this passion ever since. In fact, upon graduating high school, he made his first ascent of El Capitan in Yosemite at the age of 18. After graduating with a BA in Geography, his love for the mountains and adventure took him around the globe. Some of his trips include expeditions to: Alaska, Argentina, New Zealand, Australia, India, Nepal, Thailand, Greece, extensive climbing in the Alps and in North America. Adam is well versed in all disciplines of the sport having done one-day ascents of big-walls in Yosemite, test-piece Canadian ice climbs, many classic alpine routes in the Alps and difficult free routes. Adam holds the Level 3 Professional Avalanche Qualification from the American Institute for Avalanche Research and Education (AIARE).